The Citizenship (Amendment) Bill issue, that has kept the people of the Brahmaputra and the Barak valleys of Assam at loggerheads with each other, has now triggered the demand for separate statehood for the Barak valley. Founder president of All Cachar Karimganj Hailakandi Students Association (ACKHSA), Pradip Dutta Roy on Wednesday added fuel to the ongoing rift between the people of two valleys by raising the demand for separate statehood. ACKHSA is an influential student body of the Barak valley with its presence in the three districts of Cachar Karimganj and Hailakandi. Dutta Roy was vociferous against the intellectuals, media and other organisations of the Brahmaputra valley for vilifying the Barak valley people. According to Pradip Dutta Roy, the ‘intellectuals’ of Brahmaputra Valley, print and electronic media and various other organizations are taunting the Barak Valley people, day in and day out, and likewise, attacking the very existence of these three districts in Southern Assam, for which, getting separated from Assam can only bring about a peaceful resolution of verbal and vilifying conflicts. Criticizing, Assam Sahitya Sabha president Parmananda Rajbonshi’s comment on endorsing Assamese language to work out in the Barak valley, Pradip Dutta Roy said, “Bengali is an official language of Barak Valley and we can never accept such diktats. Either he is ignorant or doesn’t know that we have fought for it in 1961 to attain that language of ours in this region”. He also said the BJP party’s stand too is clear on giving more privileges to Barak Valley, which can only act better, if a separate state status is provided for this region. 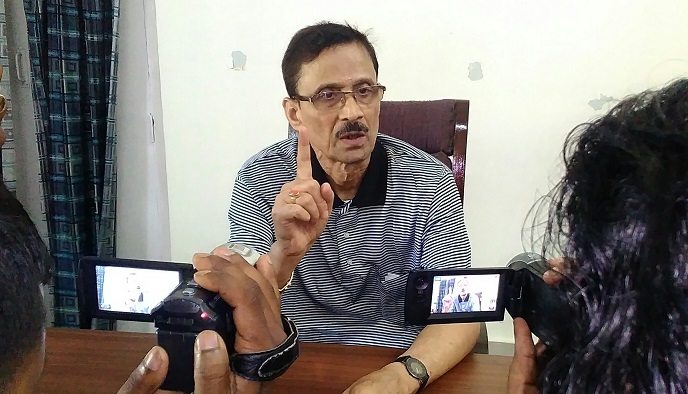 Pradip Dutta Roy before winding up, also informed, that he would fight for the case that has been registered against Ex Vice Chancellor of Assam University, Dr Tapadhir Bhattacharjee, in Guwahati, a few days back. Dutta Roy, on May 26, wrote a letter to Chief Justice of Supreme Court Justice Ajay Mishra, to remove, Justice Ranjan Gogoi from the NRC process, an act of his that raised many an eyebrows.